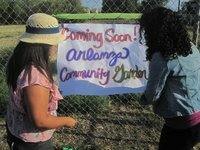 RIVERSIDE, Calif (www.ucr.edu) - Members of the public are invited to honor the memory of Dr. Martin Luther King, Jr. and help begin work on the Arlanza Community Garden during the “Grow Arlanza” day of service on Monday, January 16 from 1 to 4 p.m. The Grow Arlanza event is sponsored by the Child Leader Project, which was started by UCR alumna Samantha Wilson in 2009. The CLP has partnered with Norte Vista High School to develop and promote awareness of the community garden project, located on the corner of Cypress Ave. and Challen Ave. in Riverside. "Grow Arlanza/Cultivate Arlanza is a youth-led vision of social change in the Arlanza community,” Wilson said. “It began when youth explored issues of environmental justice in Riverside and seized the opportunity to lead the initiative to restore and revitalize the community garden in Arlanza. The MLK Day of Service is the perfect opportunity to include more people in actualizing that vision." Scheduled events include planting in raised garden beds, contributing to garden design plans, and raising awareness of the project in the surrounding community through signage and neighborhood canvassing. Fun activities for children are also planned. Grow Arlanza will also feature information booths hosted by local organizations and presentations from guest speakers beginning at 2:30 p.m. Speakers include Ralph Nunez from Riverside Parks and Recreation and MDS Shiva, a former guest scholar at UC Riverside and a leader in the CLP-India program. “Shiva is here visiting from India specifically to help with this garden project and see what can be used in the Indian context,” Wilson said. Sponsors of the Grow Arlanza event include the UC Riverside Cultivate R-Space Initiative and Urban Garden Seminar, the UC Riverside Undergraduate Research in the Community program, Growcology, California Campus Compact, and Learn and Serve America. The Grow Arlanza event is one of many being held across the country on the MLK Day of Service, which encourages Americans from all walks of life to spend the holiday working together to provide solutions to our most pressing national problems. Participation in the Grow Arlanza event is free and open to the public. No pre-registration is necessary. For more information, call (951) 616-7723. CLP Video - Grow Arlanza: Why Build a Garden?